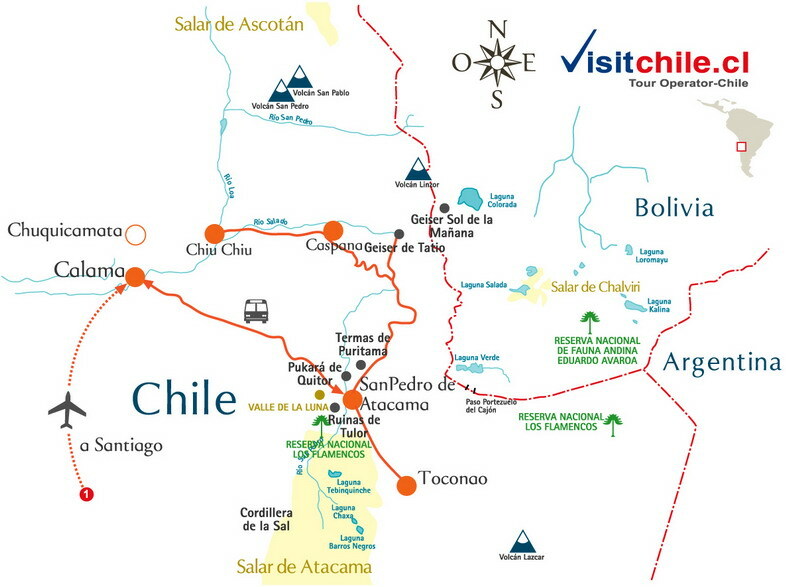 Reception and transfer from the Calama's airport to San Pedro de Atacama. PM Departure from the hotel to The Moon Valley, Only 19 km from San Pedro de Atacama is the Moon Valley, which has been designated Nature Sanctuary and is formed by a depression surrounded by small hills with impressive sharp ridges. The tour starts at the Lookout, which provides a spectacular panoramic view of the surroundings. We continue on route towards Valle de la Muerte, where we will see Tres Marías,Las Cavernas de Sal and Duna Mayor. Tres Marías are geological formations caused by successive foldings of the earth's crust. In the Canernas de Sal we can see pieces of salt gem precious crystal of transparent, produced under high pressure in the dry environment. Going east we reach to Duna Mayor, where we can admire the sunset. Lodging at the Hotel in San Pedro de Atacama. Breakfast. Breakfast. On this occasion, we’ll visit the great Salar de Atacama in Los Flamencos National Reserve where you can enjoy its immensity surrounded by fauna in the Chaxa lagoon and surroundings between the flamingos that prove to be the main attraction of the salt with their beauty. Then we will take the road to the Highlands to visit the lagoons Miscanti and Miñiques at 4,200 meters above the sea level at the base of the volcanoes of the cordillera of the Andes, through its paths we will delight us with the nature of a landscape of contrasts. We will then enjoy lunch in the town of Socaire village highlighted for its traditional cuisine. Finally, before returning, we will visit the town of Toconao, its bell tower and Church of San Lucas, both national monuments since 1951. Back to the Hotel. Accommodation at the Hotel in San Pedro de Atacama. Breakfast at the Hotel. Time for your personal activities. In the afternoon we start the tour to this beautiful Lagoon which is located 20 km. from San Pedro de Atacama, at 2300 m of height approximately. Among Atacama Salt Flat is surrounded by salt crystals in a wonderful environment. It is characterized for having turquoise waters and also, has got a level of flotation higher to Mar Muerto because of its great concentration of salt and lithium. We continue our way to the south of the salt flat where we'll find the impressive Ojos del Salar, pools of fresh water. After enjoying this impressive natural landscapes, we'll see the most beautiful sunset with a very typical drink of our country. Return to your hotel. AM Departure to the Tatio Geysers are the world highest geothermic field. They are located in the Andes Mountain Range at an altitude of 4.321 m.a.s.l., and the greatest activity takes place between 06:30 and 09:00 a.m., when atmospheric pressure generates huge steam columns that spring from the ground, producing a contrast between the mountains and the deep blue sky. On the way back we will pass along Machuca, an Atacama village which main activities are shepherding and will show its marsh, ducks and andean sea gulls.The tour includes breakfast. Desayuno. Transfer to the Calama airport. Recommendation: take very warm clothing (under 0ºC temperatures), bathing suit, towel, sun block and mineral water.